Last updated 26 April 2018 . By Faith Strickland. Opening above Walkabout comes a cool new hangout; Felson's is inspired by the book and movie, The Hustler, and will be bringing American 1950s vibes to Bristol. With quotes from the main character ' Fast Eddie Felson' on menus and blackboards, along with his picture on walls, the spot is all about casual and quirky. Open until 2am every night, the venue plans to bring fun and games to the city's nightlife with their pool tables and wacky cocktails. 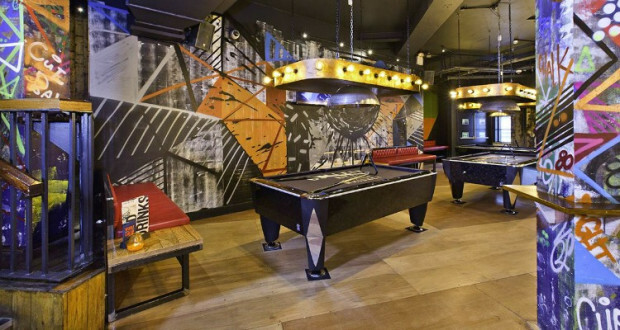 From games of pool to original cocktails, Felson's is bringing a slice of 1950s America to an upstairs space on Corn Street. The drinks menu has a long list of unusual concoctions such as 'Netflix and Chill' made using Sailor Jerry rum, butterscotch liqueur, and homemade popcorn syrup. Food comes in the form of whopping comfort dishes, from kebab meatballs on top of burgers through to loaded fries.